100% peanut butter and rolled oats are pantry staples in our house. This week I was thinking that it had been a while since I created a new breakfast recipe. I looked in the pantry for inspiration and the peanut butter and rolled outs jumped out at me. So I went to work creating a new ‘flavour’ muesli. I am happy to say this was a hit with our peanut butter loving family. * adjust the quantities of these ingredients to suit your families tastes. Next time, I’ll add a little more peanut butter for us. Cook for another 8 minutes. Adjust the timing base on the level of goldeness your family prefers. Stir through the sultanas, then store per instructions. 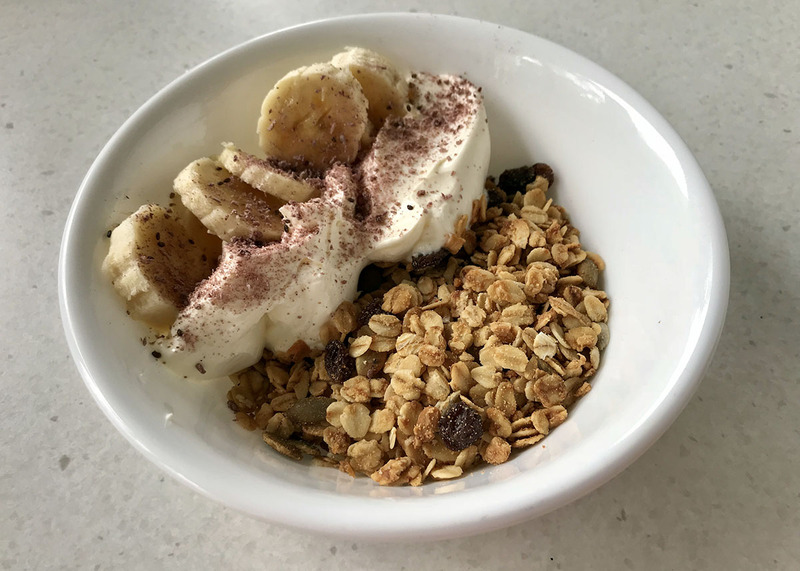 * I line my trays with baking paper, then when the muesli is cool you can pick up the baking paper and use it like a funnel to tip it into your glass storage jar. Not suitable for freezing. Best stored in an airtight jar or container for up to 2 weeks. You can mix this with Chocolate Breakfast Puffs to make a combination breakfast.